Thank goodness for Delia! The Winter Collection is one of my favourite Delia books, probably because it is full of warming one-pot recipes. 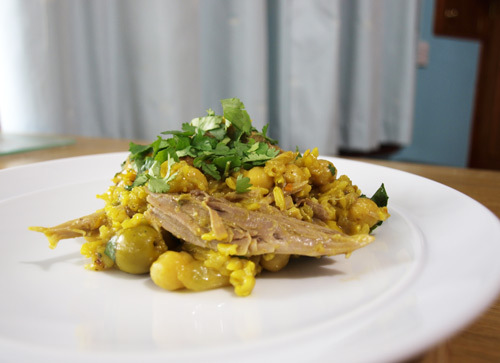 The baked risotto dishes are probably the most made dishes from this book, but coming up close behind is this recipe for Moroccan Baked Chicken and Chickpeas with Rice and dear Delia has even posted the recipe on her website so I don’t have to retype it! Now you may have noticed that my title states Turkey rather than chicken, I had frozen the legs of the turkey from the hamper I won before Christmas, so was able to use those instead of chicken. It worked really well, although as the legs were huge, I took the meat off them whereas with the chicken thighs you can serve them whole. 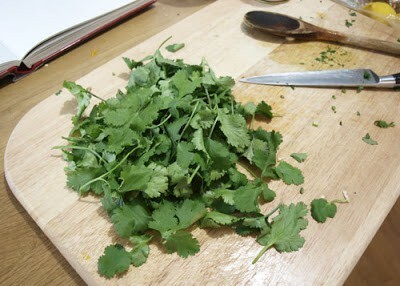 There is a considerable amount of coriander in this dish, including the stalks, so I am entering it in Karen’s ‘Herbs on Saturday’ blog hop at Lavender and Lovage. Thanks for entering this into the Herbs on Saturday blog hop Janice. I know this recipe well, as I have that Delia book and have made this recipe several times, it is a wonderful recipe. Now as you can imagine there is a packet of chicken thighs in my fridge and a tin of chickpeas in the cupboard. Good old Delia!! Love the turkey substitution! It sounds lovely, and would be especially nice in this chilly weather at the moment. That sounds a book I need to be getting hold of- inspiration for tasty yet simple one pot weekday meals are always in demand with us! This sounds great, good old Deila!